On August 8 and 9, the “Joshikai II for Future Scientists: International Mentoring Workshop in Science and Engineering” was held in Tokyo at the National Museum of Emerging Science and Innovation (“Miraikan” in Japanese). 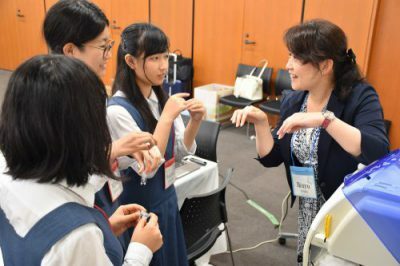 Altogether, some fifty-one female students participated from three junior high and nine senior high schools in Japan, conducting experiments and engaging in discussions with women mentors from overseas. 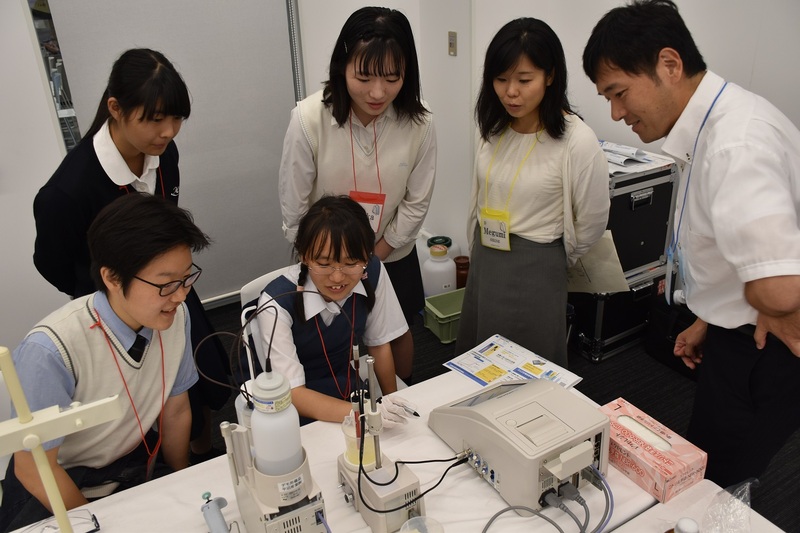 As women around the world are being encouraged to enter the STEM (science, technology, engineering, mathematics) fields, it has become conspicuous that fewer women are doing so in Japan than elsewhere. Recognizing the untapped potential of women, the Japan Atomic Energy Agency (JAEA), together with the OECD Nuclear Energy Agency (NEA), co-sponsored and staged Joshikai II for the purpose of encouraging female junior and senior high school students in this country who might be interested in science or engineering to have confidence in their choices and to pursue their dreams, doing so by showing them successful examples. For this second Joshikai, junior high school students were included for the first time. A session was also added for parents and teachers. JAEA President Toshio Kodama told the attendees, “It is increasingly recognized that the equal participation by men and women throughout society is important. It is also equally important that women play a greater role in the sciences. 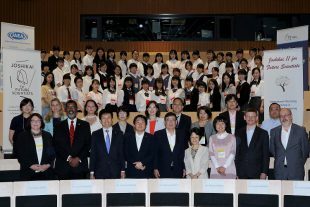 I have heard that, in the year since the last Joshikai, the attitudes of the senior high school students participating then have changed remarkably, thanks to their interactions with women mentors active in Japan and overseas.” He then expressed his hope that junior high school students—a new target this year—would also broaden their outlook as a result. 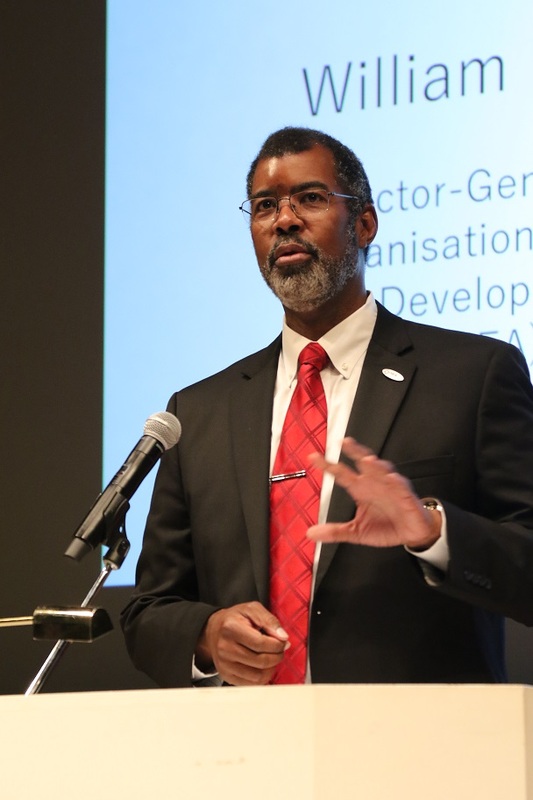 “Women bring new viewpoints,” said the next speaker, NEA Director-General William D. Magwood IV, adding that he expected them to participate more in the nuclear industry. He told the students that their seniors and mentors who were active in the sciences had gathered there to support them as they chased their dreams and pursued their careers with confidence. He urged them to make Joshikai II a personal opportunity. Two guest speakers, Yuhei Yamashita, Japan’s parliamentary vice minister of the Cabinet Office responsible for gender equality, and Hideki Niizuma, Japan’s parliamentary vice minister of the Ministry of Education, Culture, Sports, Science and Technology (MEXT), then spoke about the reasons why so few women in Japan are working in the areas of science and engineering. They said that women in this country have found it difficult so far to be successful simultaneously in both work and family life, including raising children and caring for elderly parents. Meanwhile, efforts to enlighten women students about careers in science and engineering have generally been lacking. 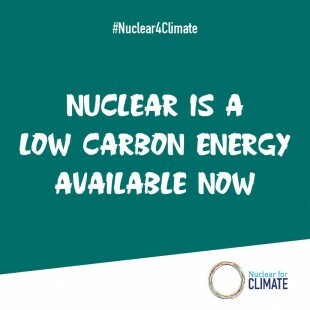 Under such circumstances, both parliamentary vice ministers referred to the importance for everyone—women, men, the young, the experienced, and people from diverse backgrounds—to be engaged in all areas of study and research if Japan is to remain a top runner in the areas of science and engineering. 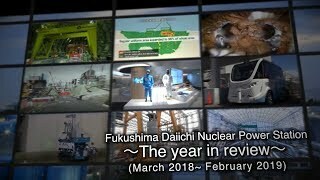 Both speakers, saying that the government wished for a society to be realized in which women do not have to abandon their dreams, encouraged the participants to consider nuclear or other science and engineering fields. The keynote lecture was delivered by Associate Professor Ayumi Asai, of the astronomical observatory department of the Graduate School of Science at Kyoto University, who spoke on the theme, “The Way to the Sun and to Space.” Born in Kyoto and a devotee of kendo (a traditional Japanese martial art which descended from swordsmanship), Asai also loved physics, chemistry and mathematics when she was in junior high school. A scientist by nature, she decided to major in solar physics, her current professional field, after entering Kyoto University, where she now teaches. Although her study and research bore fruit, she said that she has scarcely spent time with her family, even after marriage. The students listened enthusiastically as Dr. Asai then explained how solar flares—ejections of mass from the sun—affect our solar system, including all of us living on Earth. She then encouraged the attendees by saying that there were many options in life, and that they should be confident and choose their truly desired path. Next to speak was Professor Cait MacPhee from the department of biological physics at the School of Physics and Astronomy in the University of Edinburgh in Scotland. Born in Australia, she talked about career selection based on her own experiences. Concentrating on the study of protein structure and function, she is currently working on explicating the onset mechanisms of Alzheimer’s and Parkinson’s diseases. Despite her brilliant biophysics career, however, she did not pursue science initially. She first majored in music, wanting to become a clarinet player. Eventually concluding that that was not for her, she gave in to her own deeper curiosity and selected another way. Once in science, Dr. MacPhee shifted from biology to physics, which appealed more to her sense of precision. Married and with two children, she told the students that as many as sixty-eight percent of all women physicists end up marrying physicists, including herself. When husband and wife are both scholars, she went on, it is normally difficult for both to find jobs at the same place, particularly for the woman. For the two years before getting married, she and her husband lived separately in Edinburgh and Cambridge, respectively, and had to visit each other back and forth. Later, when she was pregnant, they settled in Edinburgh, where she could continue her work, with her husband sharing in the household matters. According to Dr. MacPhee—who changed her specialty from music to biochemistry to physics—careers are not “straight” like the moving walkways at airports. Not being sure of what you want to do is not the real problem, she said. What is important is that you make the choice yourself and have confidence. The opening ceremony closed with a video message from Hélène Langevin-Joliot, granddaughter of Marie and Pierre Curie. Her parents, too, were both scientists, and her path was naturally into science as well. During her junior high school years, however, France was under German occupation, with Nazi education prescribing a limited role for women: church, kitchen, children. Langevin-Joliot rejected that thinking, saying that women should work as men do. But she was told by her mother that women had to try harder to gain confidence in order to enhance their presence. Things sometimes go better by using women, she added. 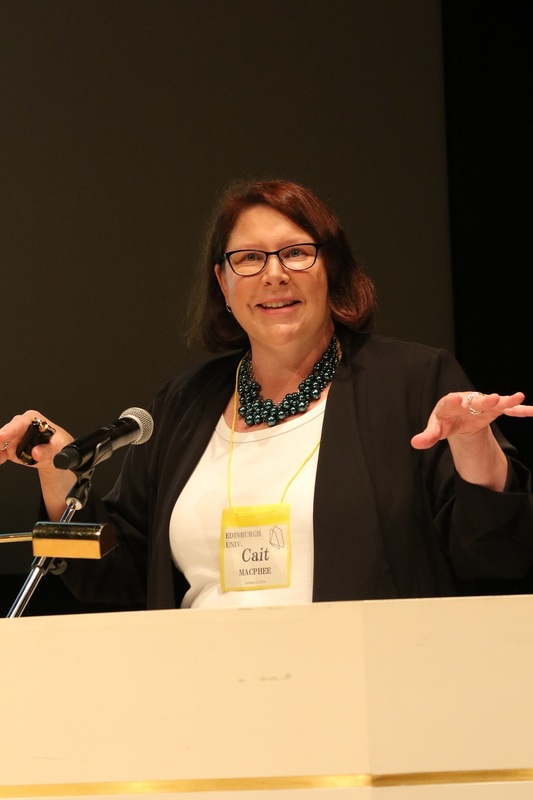 Today, when women do not necessarily find it easy to be successful, Dr. Langevin-Joliot said that most Japanese women consider it important to succeed both in family life and their careers. “It would not be a good outcome if one was denied the freedom to have a family, an important part of one’s life,” she said. “While some men obviously don’t want their wives to have careers, it is important not to leave it as just the ‘wife’s issue.’ Both husband and wife must face existing problem together.” For that to happen, she said, the support of society is required. In the afternoon of the first day, hands-on activities were organized using scientific equipment, with panel discussions held featuring women scientists from overseas. 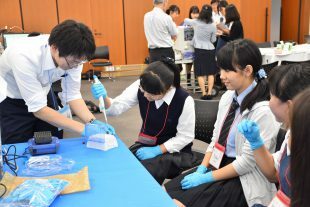 On the second day, August 9, workshops were staged for the students. The fifty-one junior-high and high school participants, who were divided into six groups, took part in spirited discussions on their own futures, then gave presentations to report their results (photo). One of the invited women scientists or scholars was assigned as a mentor to each group, supporting the discussions. The students chose one of two themes: either “my future at the age of 22” or “my future at the age of 32.” Each then talked about the career she had “chosen,” describing her predicted life at that point. Many of them said that they wanted to become doctors, scientists, pharmacists, and so forth, in order to help society. One of the girls said that she wanted to study criminalistics and work to solve crimes. In the reporting session, one group reported that although some members, when first thinking about their lives at 32, were initially concerned about trying to have a family and a successful career at the same time, they also realized, with the help of the mentor, the importance of enjoying life positively and being confident in their own thinking. Another group summarized its conclusions by saying that when someone confronts a difficulty, there is more than one way, and that it was always necessary to take steps toward the next goal. That group also concluded that to be successful at work, people must strive to improve their ability to communicate and make use of knowledge and information from overseas, but that ties with others are the most important. Based on statistics from international organizations and the like, Japanese women still participate in the workforce at lower rates than do women from other industrially advanced nations. Given that, and with the national government working to improve the situation, the workshop was a challenging event, aiming as it did to increase women’s opportunities to work in scientific fields a couple decades from now, along with other diverse effects.